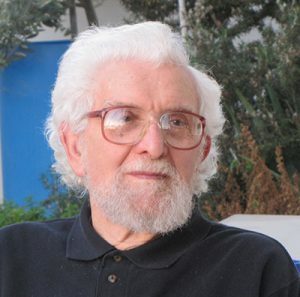 Sam Schweber, Professor Emeritus of Physics, died May 14th at the age of 89. A theoretical physicist and historian of science, Sam was among that first generation of Brandeis faculty whose genius turned a fledgling institution into a university of the first rank. He published his first book in 1956, when not yet thirty, and his last in 2012, in his mid-eighties. His was an extraordinary life and career. Sam was born in Strasbourg and came to this country at the age of 14. Like many immigrants and children of immigrants, he attended college at City College of New York, and he then went on to earn an M.S. from the University of Pennsylvania and a Ph.D. from Princeton. A postdoctoral fellowship at Cornell gave him the special opportunity to work under Hans Bethe (whose biography he wrote, many years later). Sam came to Brandeis in 1955 as associate professor of physics and quickly became involved in building the young department. In 1957, the Physics Department started a graduate program, and the following year it established, at Sam’s initiative, a summer institute in theoretical physics, bringing to campus leading physicists as well as selected graduate students and postdocs, for weeks of seminars and colloquia. The institute ran annually for fifteen years, until the federal funding ceased. The young Sam Schweber had clearly impressed Hans Bethe. In 1955 he co-authored with Bethe (and a third physicist) the two-volume Mesons and Fields, and in 1960, the same three authors published Quantum Theory of Fields. A year after that, in his foreword to Sam’s new book, An Introduction to Relativistic Quantum Field Theory, Bethe observed, “It is always astonishing to see one’s children grow up, and to find that they can do things which their parents no longer fully understand.” This book remains in print five decades after its initial publication. Sam continued to conduct research and publish in the field of quantum field theory, while also playing an integral part in the growth of Brandeis University. His scholarly interests then started to shift. Volunteering to teach a course on how probability entered the sciences, he became fascinated with the history of science and chose to spend his next sabbatical in the History of Science Department at Harvard. In the third decade of his career, Sam became a historian of science. He joined our interdepartmental program in History of Ideas, and in 1982 was appointed to the Koret Chair in the History of Ideas. That sentiment will surely be echoed by the many former Brandeis colleagues and students who greatly admired Sam and learned from him. Sam was a great and kind man and a gifted teacher. In the post-nuclear era Sam and Gene Gross brought the cordial and friendly attitudes of pre-war Europe into the classroom. He knew his role and (being a) role model well, a suit jacket lecturing paternally to hippy era nerds. Sam was a class act.